Her Royal Highness the Duchess of Gloucester today (22 September) visited the Movember Centre of Excellence based within the Centre for Cancer Research and Cell Biology (CCRCB) at Queen’s, to learn about the ground-breaking prostate cancer research taking place. The Duchess, who is the royal patron of the men’s health charity, Prostate Cancer UK was introduced to patients and researchers leading on revolutionary projects at the Movember Centre of Excellence, one of Prostate Cancer UK’s major research programmes. CCRCB Director Professor David Waugh said: “Our mission in the Centre is to translate our scientific discovery to inform how best to treat patients in the clinics. In this regard, our research has a direct impact in improving patient outcomes and their quality-of-life. Commenting on the visit, Angela Culhane, Chief Executive of Prostate Cancer UK said: “Prostate cancer kills one man every 45 minutes. It’s the most common cancer in men and is set to become the most common cancer of all by 2030. “Together with the Movember Foundation we launched the Centres of Excellence programme to bring the best minds in prostate cancer research together in a bid to stop prostate cancer in its tracks and ensure more men survive the disease and continue to lead a good quality of life. Queen’s Professor Joe O’Sullivan has led a clinical trial for men who present with prostate cancer which has spread to the bone. The trial, known as ADRRAD, offers a novel combination of therapies to patients including treatments only available to those on the trial. Her Royal Highness also met with Dr Suneil Jain, a clinical researcher at Queen’s who is leading the SPORT clinical trial, which seeks to improve the use of radiotherapy in men diagnosed with high risk prostate cancer. James Greene was the sixth person to take part in this research trial which is only available to patients in Northern Ireland. James said: “Taking part in this trial meant I was offered a high-dose five treatment course instead of enduing three months of treatment. To find out more about supporting cancer research at Queen’s University Belfast, visit the Development Office website or contact Helen Surgenor, (Head of Medical Fundraising), tel: +44 (0)28 9097 1568. Media enquiries to Suzanne Lagan, Queen’s Communications Office, on tel: +44 (0)28 9097 5292. 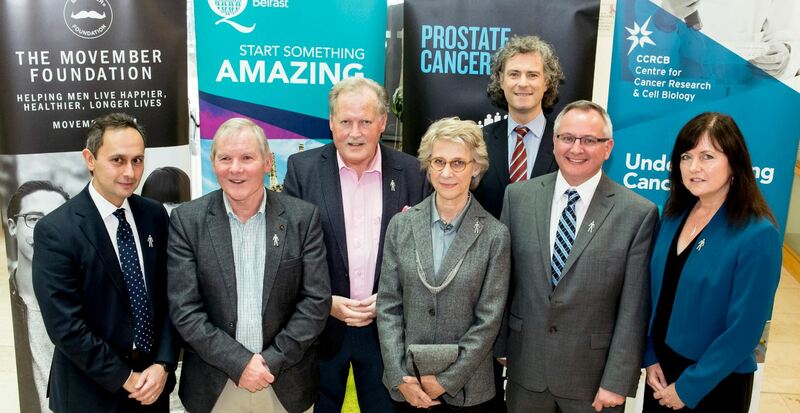 Pictured (L-R): Dr Suneil Jain, prostate cancer patients James Greene and David Livingstone, The Duchess of Gloucester, Professor Joe O'Sullivan, Professor David Waugh and CEO of Prostate Cancer UK, Angela Culhane. The Movember Centres of Excellence were launched in 2014 in partnership with Prostate Cancer UK. These centres, based in Belfast-Manchester and London, bring together groups of scientists and clinicians with different areas of expertise to address the big questions in prostate cancer research – from basic biology to inside the clinic – as part of a structured research programme. The Belfast-Manchester centre specifically aims to improve outcomes for men living with advanced disease.